A couple of years ago I made a summer bucket list and I thought it would be fun to do it again this year. 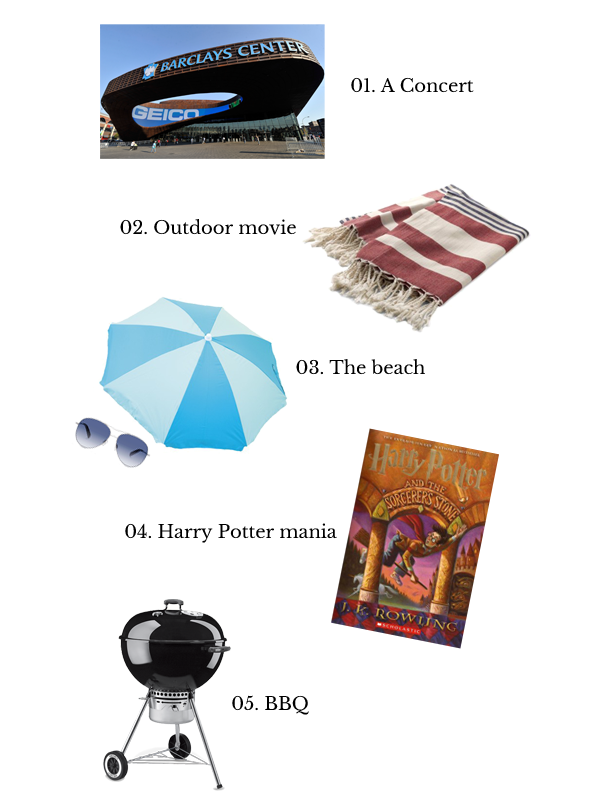 Here are the five things I hope to do this summer! 01. Go to a concert- Last summer I went to see Beyoncé and it was the best concert I’ve ever been to (not that I’ve been to tons, but it was seriously amazing). I really enjoy concerts and this summer I’d like to go to another. 02. Go to an outdoor movie- Every summer I say that I’m going to watch a movie in Bryant Park, but it hasn’t happened yet. On one hand, it seems like it’s always super crowded, which is not really my scene. On the other hand, I’m sure I’d have fun if I went. It needs to happen! 03. Go to the beach- It’s not summer if I don’t make it to the beach at least once. 04. Read the Harry Potter books and watch the movies- I’ve mentioned that I’m reading all of the books and I’ve been watching each of the movies as I finish each book. My goal is to finish the whole series before the end of summer. 05. Go to a barbecue- What’s better than grilling your own hamburgers and enjoying an ice-cold refreshment on a nice summer day? There’s no space to barbecue in my apartment, but maybe a few of my friends will get together for a summer potluck in the park. Tell me: What’s on your summer bucket list?